To heat greenhouse in winter or not? The Growing Dome is a marvel of technology in its efficiency. With 25 years of research we can tell you that can be up to three times more efficient than a traditional greenhouse. Not only does the geodesic shape contribute to this efficiency, but the solar powered heat storage systems and smart insulation are one-of-a-kind in the industry. Given 5-6 hours of sunlight on average per day, your Growing Dome with 5-wall polycarbonate glazing can stay 30 degrees F warmer than the outside temperatures on a cold winter night. This means that it needs to get below zero degrees Fahrenheit (-17 C) outside before you start experiencing freezing air temperatures within. As the temps drop outside, the span between the outdoor and indoor temperatures increases always. To give you specifics, when we have had temps in the -20’s Fahrenheit (-29 C), the inside temps stay in the upper teens (15 to 19 F and -7 to -9 C) in an unheated Growing Dome. Even with -19 F outside, cold hardy veggies and herbs can survive and the plant tissue can remain undamaged, but you will not see growth during these periods. Keep in mind that if the plants haven’t “hardened off” (i.e. accustomed to the cold temperatures), they are vulnerable to a sudden early old snap. A couple of cloudy days with no sun and bitter cold with outdoor temperatures in the -20’s F can be very challenging indeed, so it’s important to keep an eye on the weather. With the early cold snap or series of cloudy days, a back-up heater can be very, very helpful in ensuring the safety of your garden. Keep in mind, though, that we worry a lot about winter cold especially during our first winter with our “new babies.” The Growing Domes are complete environments that are more able than we give them credit. Winter plants are happiest at 35 degrees F minimum, but will still stay alive at 15 degrees F, according to Eliot Coleman’s book Winter Harvesting. We have found that he is “right on the money” on that data. With ample sunshine (5-6 hours per day) and outdoor temperatures remaining above 0 degrees F (-18 C) you won’t need to add heat to maintain your frost hardy plants. If you are interested in higher production and growing rather than simply maintaining your plants during these cold snaps, then you will need to supplement with heat somewhere between 0 and 10 degrees F (-18 to -12 C). If you are looking at growing more than frost hardy vegetables, you will need to determine what your minimum temperature in the Growing Dome should be and then take measures accordingly. For example, many people like to grow citrus in their Growing Domes. Citrus will maintain their leaves, flower, AND produce fruit as long as the temperatures remain above 26 degrees F (-3 C). The citrus won’t die if they get below that temperature, but they will lose their leaves and go dormant until spring. A frost cover (also known as floating row cover) will give extra 4 to 8 degrees F (down to -4 C) of frost protection, and then, depending on where you live, you will likely need to add minimal heat with a small propane heater. See examples below and also see our blog post on floating row covers for more information. We recommend you take a moment to consider that your unique environment will have an effect on the efficiency of your Growing Dome: Do you live in a cloudy area? How many hours a day of sunlight does your Growing Dome get during the coldest month(s) of the year? Do you live in a canyon? Are there coniferous (pine or spruce) trees blocking sunlight to the Growing Dome? Do you have the recommended size of above ground pond installed and filled? Are you using soil beds or hydroponic beds? Soil stores the sun’s heat better than bins of water will. If you had to make a sacrifice in terms of a less-than-ideal location for your Growing Dome with minimal solar exposure, then you won’t have quite the level of self-sufficiency other owners do. If you live in an especially harsh climate like Alaska or a very cloudy climate like the northern midwest that has minimal sunlight in the winter, then you will need to supplement with heat to grow year round. It all depends on your situation. Just remember that you will need approximately 1/3rd the amount of heat you’d need in a traditional greenhouse, so you are already starting ahead of the game. A couple tips to help the Growing Dome perform at optimum efficiency: Be sure to fill your tank before you hit the depth of winter; remember that it is your most important heat sink. With your necessity to take in the warm sun hours as the days shorten, be sure to take down your shade cloth no later than October. You should adjust your automatic greenhouse vent openers to open minimally. Be sure to trim up dead leaves on the tomatoes or other vines as you go into winter and make sure they aren’t blocking the sunlight. Pull out vines if they are not producing and/or expired. Last, but not least, clear the density of plants in front of the above ground pond wall to expose the front to the sun’s rays. You live in Alberta, Canada and get well over 300 days of sunshine per year. It gets cold though with temperatures dipping down into -30 and sometimes -40 degrees F (-34 to -40 C). 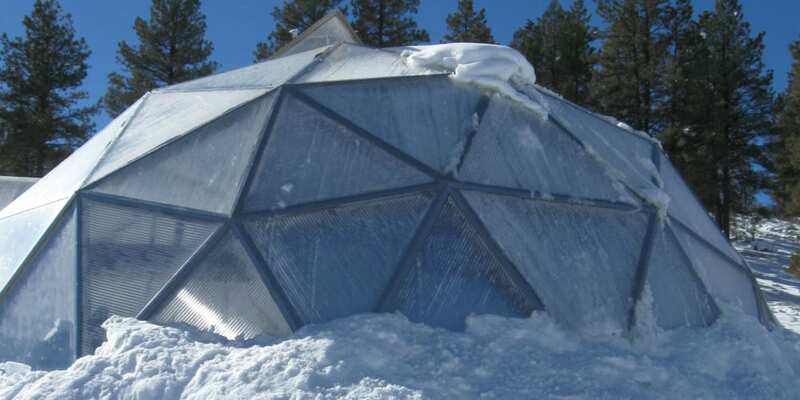 You are interested in growing the best crop you can of cold weather plants like kale, chard, broccoli, lettuce, endive, bok choy, spinach, and snow peas, so that you and your family can eat regular meals from the Growing Dome. You are willing to put in some extra time and money to make this happen. You live on the Minnesota and have very few days of sunshine in November through February. The temperatures outside can get down to -25 F. You are interested in growing frost hardy plants through the winter. You should notice that in none of the examples we gave did we mention growing warm weather crops like tomatoes, squash or peppers in the winter. The reason for this is that to grow these crops out of season anywhere takes a tremendous amount of either fossil fuels or creative renewable energy engineering. This is typically out of the realm for most backyard gardeners. If you are out of the ordinary and do want to tackle this, give us a call and we’ll talk through your plans with you and make suggestions. As always, if you have questions or want help talking through your specific situation give us a call at 800-753-9333. I use three methods of heating, and yes I am growing tomatoes. Invariably there are times when one heating method fails or is unavailable. Having alternate methods keeps me from losing anything.